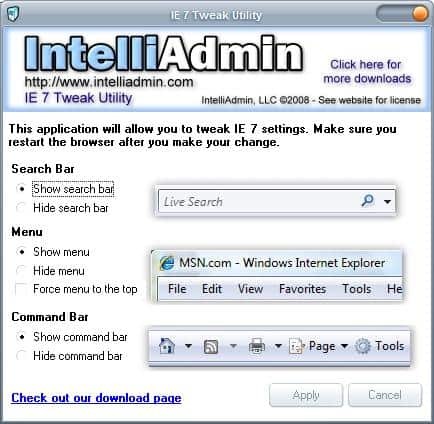 The IE7 Tweak Utility is a portable software program that allows you to change a few settings in Internet Explorer 7 that cannot be changed directly in the browser. I assume they are handled in the Registry but have not checked if that is true for all of the settings. The tool provides a clean interface after starting it up. Changes can be made to the Search Bar, the Menu Bar and the Command Bar which means it basically a tool to tweak toolbars in Internet Explorer 7. The search bar can be set to hidden which would have the effect that it would disappear in Internet Explorer 7. The same is true for the Command Bar which can also be hidden. The Command Bar is a set of icons that sit directly below the search form starting with a link to the homepage and ending with the Tools menu. The Menu on the other hand can be hidden as well or forced to the top which is an interesting option. You might remember that the menu in Internet Explorer is below the search bar. If you want it the other way round you can apply the tweak. I tried it a while ago. It does do what you said in the post, but I really found it so damn simple at that time, that I uninstalled it right away. Quite disappointing actually.